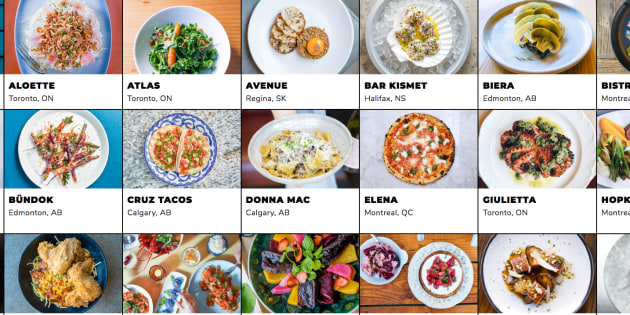 Every year, in a shameless but effective ploy to get people to travel across the country, Air Canada publishes a list of the best new restaurants. They've just unveiled their longlist of 30 new spots, and we'd like reservations at all of them, please. This year's contenders include Japanese, Thai, Mexican, Filipino, Argentinian, Moroccan, French, Italian, Indigenous and local cuisine, and they're scattered across the country in big cities like Toronto, Montreal, Vancouver, and Calgary as well as more unexpected places like Jordan Station, Ont. and Saint-Benoît-de-Mirabel, Que. Take a look at the list below. We want to try: Pacific crab boil, featuring dungeness crab, mussels, clams, bacon banger sausages, corn on the cob, nugget potatoes, foot hills butter and lemon. We want to try: Attila D'hen bao, made with Kanto's fried chicken tossed in hot sauce with onions, sili and sesame. We want to try: The menu isn't available online, but the rose hip ice cream with spicebush meringue, beet and rose thyme sauce photographed in this Globe interview with the chefs looks mouthwatering. The 10 finalists will be announced at a ceremony in Toronto in October and will appear in the November issue of enRoute magazine. Happy eating! CORRECTION - AUG. 10, 2018: An earlier version of this piece listed Edmonton, Alta. as the city in which Donna Mac is located. It is located in Calgary.